One hour before school started, eight educators sat around a table at Four Corners Elementary, looking at a graph. The line showed one second-grade boy’s progress on reading at grade level since he enrolled at the school. It wasn’t heading in the right direction. “He’s kind of stayed flatlined this year. Do you see that in the classroom, Lindner?” asked Chelsea Zuber, the school’s learning resource center teacher. “Yeah, I do,” responded his teacher, Melissa Lindner. The problem? The boy was missing reading time in class because he gets pulled out for behavioral help. And his home life was in flux, another teacher pointed out – his parent had recently started dating someone new. The boy is one of more than 500 students at Four Corners Elementary, and one of about 20 second-graders that teachers, aides and principal Phil Decker discussed that morning. One child was behind in school because her mother had pulled her out of classes for more than a month to escape a troubled relationship. Another had rarely been on time to school since her family began living in a motel. Others had stellar attendance, but struggled to make progress because of challenges with speech or vision. For each child, the staff discussed solutions. Can we have a social worker reach out to the family? Switch the kid to a different reading group better tailored to his needs? Reschedule behavioral support time? “Kids, if they’re behind grade level, need to make accelerated growth,” Decker said. Like public schools across the U.S., the Salem-Keizer School District relies on a 50-year-old tool to improve its most challenged schools: federal money. At Four Corners, these half-day meetings, where educators take an in-depth look at every student’s reading progress and discuss problems, are made possible by using federal money to hire part-time teachers to cover classes. Twenty-nine elementary schools in Salem-Keizer receive extra money through Title I, a program dating back to the Johnson administration. It was part of a civil rights agenda designed to ensure students in the nation’s poorest schools had an equal chance at academic success. Johnson’s dream was equitable resources between the inner-city and rural districts serving increasingly low-income families and well-funded wealthy suburban districts. “Faced with the largest educational needs, many of these schools districts have inadequate financial resources,” he said in a budget message to Congress in 1965. Citing data on the cost of educating a child versus incarcerating him later in life, Johnson called for $1 billion in federal money – $8.1 billion in 2019 dollars – to develop a program supporting low-income schools and districts. He called the effort vital to ensuring future American military readiness and economic growth. “Every child must be encouraged to get as much education as he has the ability to take,” Johnson wrote. Today, that money remains vital as educators teach students who often show up to school hungry, without clean clothes or having transferred from another school mid-year. The challenges facing students at these schools are stark, as revealed in data and the accounts teachers and staff share about what goes on in class. At many elementary schools in Salem serving poor families, the average student starts kindergarten recognizing between four and eight letters in the alphabet, state data shows. The state average is 12. At Salem’s best-performing schools, it’s as high as 15. Similar gaps exist in children’s ability to distinguish the sounds of letters or solve simple math problems. “Our students come in across our school district below everyone else. That means that we have nine years of work to do and six years to do it,” said Jessica Brenden, Hallman Elementary School principal. “There’s a huge sense of urgency,” Decker said. Across Oregon, average spending per student has grown 7% in the past decade, adjusted for inflation, with leaders from Gov. Kate Brown on down now advocating $2 billion more in school funding. Overlooked in the debate over dollars and numbers is how schools are doing today with what they have. Salem Reporter examined how the district's most challenged schools function and how they spend the extra federal money they receive. We focused in depth on three Salem-Keizer elementary schools, all receiving Title I funding. Four Corners, Hallman and Highland share similar student demographics and challenges but have produced different results improving student performance. The three schools serve what are considered impoverished student bodies, with up to 90% of students qualifying for free or reduced lunch. They are racially diverse schools with a majority of Latino students and a high percentage of English language learners. Each has a dedicated principal with years of experience in elementary education. The schools have endured more than a decade of shifting strategies imposed by federal and state agencies, with very different ideas of how to measure school performance and how to fix schools doing poorly. Those range from President George W. Bush’s Leave No Child Behind approach for targeting low-performing schools to President Barack Obama’s Common Core approach that set standards for what children should learn. Changing strategies mean re-tooling education programs, adding new reporting and collecting new data. None of that, however, changes what teachers face each day: the student walking in the door. 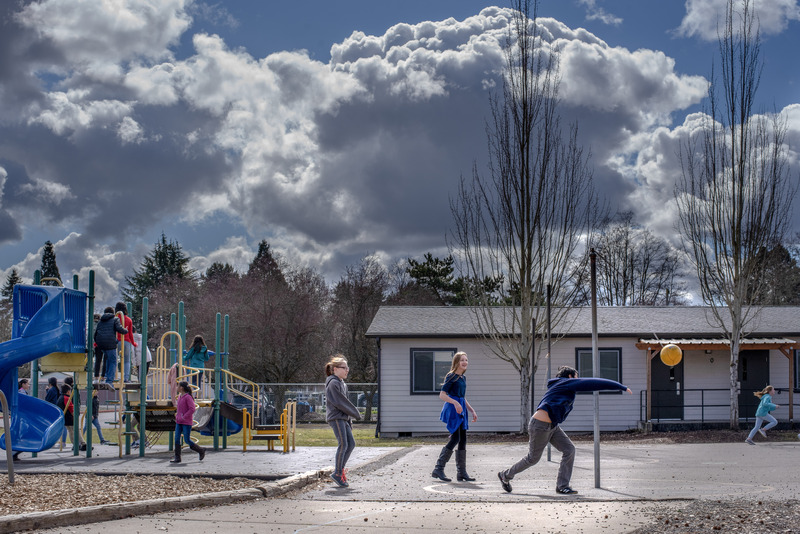 Oregon educators say social problems at schools, from the number of homeless students in class to increased disruption caused by behavior, are worsening. But teachers and their leaders are judged not on the nuance of the class but what percentages and decimal points say about test scores and other measures. And even as standards have changed, the state still categorizes schools by achievers and those needing help. Four Corners is one of Oregon’s 1,080 schools ranked this year as most needing to improve student performance. The school has seen modest improvement in reading, but students continue to struggle with math: only 14% met state standards last year, and individual student improvement is lower than the state average for similar schools. Hallman was once listed among the bottom 5% of Oregon schools and the worst elementary school in Salem-Keizer, struggling with low scores and low student academic growth. But the school used a multimillion dollar grant it won in 2010 to nudge student performance upward. At Highland, about one-third of students meet the state standard for reading, and one-fifth for math, numbers that are higher than at schools with similar demographics. The school has performed notably well in improvement among individual students year to year. Now, most Highland students are improving faster than the average for similar schools around Oregon. Schools in the Salem-Keizer system can’t avoid the state metrics, but they have considerable freedom to figure out how to post better results. In some ways, the schools serving impoverished students get a blank check – federal money passed on to them under a formula to serve the most challenged schools. The money comes with some requirements, but each school can make choices that best suit the needs of its student body in how to use teachers, other staff, classrooms and the building. The Salem-Keizer School District this year spread about $12.5 million to 38 of its 65 schools. The district can’t substitute the federal money for a school’s regular funding. “They have to get the same equal base as everyone gets,” Myers said. Wendy Roberts, the district’s federal programs coordinator, and Myers work with staff to set the district threshold for which schools will receive federal dollars based on poverty rates. Schools with at least 75% of students in poverty have to receive some funds. In Salem, schools on the list get a set amount per student that varies depending on how many kids are in poverty. Highland, Hallman and Four Corners each receive an extra $625 per student in poverty. At Highland, with one of the highest poverty rates in the district, that works out to about $225,000 per year. Three funding tiers below those schools cover schools with at least 43% of students in poverty. Myers said a school’s needs grow exponentially as a greater percentage of students are in poverty. When eight out of 10 students start classes behind grade level, come to school hungry or have parents who struggle to help them, the needs are far greater than in schools where that number is only four out of 10. Federal rules require schools to outline how they spend the money and set aside a portion for family outreach and engagement. They must submit a school improvement plan to the state and district. Roberts and Myers review them for progress and determine whether proposed spending is in line with each school’s goals. “Really the plan forces them not to jump on the latest bandwagon,” Myers said. Elementary school directors and Myers look for principals who are risk-takers to lead challenged schools. “We give them the professional latitude to try something,” Myers said. Some spending is common across schools. 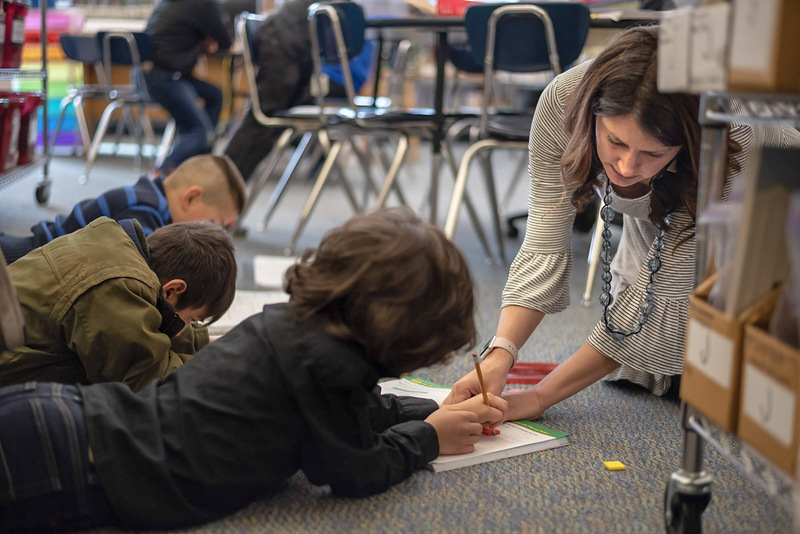 Many of Salem-Keizer’s Title schools, including Highland and Hallman, employ a community school outreach coordinator to boost attendance by reaching out to families individually and planning events and family literacy programs. At Highland, the half-time job costs the school $38,700. This year, Principal Christi Cheever wants the coordinator to help families get their kids to school. “We have seen good growth with academics, but our attendance is one of the lowest in the district,” Cheever said. Last year, 117 students – about one third of the student body – were chronically absent. The three schools use some funds for extra staffing so teachers can use school time to dig deeper into curriculum or discuss individual students’ learning. 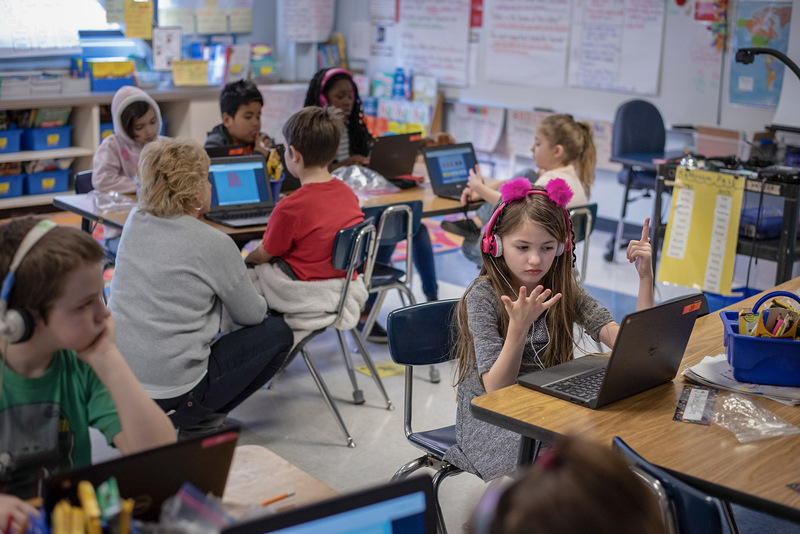 At Four Corners, Decker hired four part-time teachers to cover classes one day every other week, allowing regular teachers to gather for a half-day to examine data on student progress and lesson plan. Those instructors cost $43,760 for the year. He’s also hired a reading teacher and a bilingual instructional aide to help students with reading, at a cost of about $105,000 a year. At Highland, more than half of the school’s extra funding goes to seven instructional assistants, at a cost of $168,875 a year. Those staff help students who are behind and struggling with both academics and behavior, working with them individually or in small groups so teachers can focus on other students. Though the goal of federal funding is to help students who might otherwise lag behind in class, funds don’t have to go directly toward academics. Many schools spend money to help students with behavior or challenging circumstances at home. At Hallman, a behavior specialist can work one-on-one with students who are being disruptive or challenging. This school year, Four Corners opened the “Cub Den,” a refuge for students who struggle with regulating their emotions or behavior. A behavior specialist ($54,700) works with aides to guide students through activities like crawling through a tunnel, meditations or a game like hangman until they’re calm enough to return to class. Staff said it’s helped them better manage classrooms. “It’s been amazing. We have an area for them to go to,” said Jennifer Hook, an instructional aide who helps staff the Den. The school also employs a social worker one day a week to reach out to families and help address problems that might be keeping kids from coming to school. Decker said he chose to allocate more of his funding to behavioral and social support this year, shifting money from advanced training for teachers. “Teachers are like, ‘I’ve been doing that for years, I got that,’” he said. Instead, they asked for help managing behavior in their classrooms. How should the public decide how well a school is doing? Oregon has for years used “report cards” that try to distill variations in student demographics, principals, teachers into a few scores intended to be understandable to an average parent or taxpayer. Student scores on standardized tests in reading and math have always played a large role on those report cards. Schools are also evaluated on growth – how much an individual student’s score on standardized tests improves from year-to-year compared to similar students in Oregon. But increasingly, Oregon is looking to other measures as well. Student attendance was factored in for the first time this year, and state officials are also considering English language proficiency, a measure of how well students learning English are on track to fluency. “The accountability model that we have now” is looking at “some really different metrics than we’ve looked at in the past,” said Shawna Moran, an education program specialist for the state. Still, the metrics don’t give educators any certainty about what works. The variations among Highland, Hallman and Four Corners suggest some factors that make a difference, but don’t provide a clear blueprint for turning a school around. Despite the experimentation and effort at reform, district officials said they can’t point to a single factor or magic solution that accounts for those differences. “I don’t know that we have figured out exactly what the formula is,” said Olga Cobb, one of three elementary school directors for Salem-Keizer, and the former principal of Chávez and Highland elementary schools. Correction, April 16 at 9 a.m.: Due to inaccurate information provided to Salem Reporter, this article incorrectly listed the amount of Title I funding per student that Highland, Hallman and Four Corners receive. This is part one of a five-part series examining the Salem-Keizer School District's most challenged elementary schools. Part two: We take you inside Four Corners Elementary School, where a beloved principal has spent nearly a decade trying to lift the school off the state's list of lowest performers. Read it here. Behind the scenes: How this story came about, and where we got our data. If you have questions or comments, please email them to rachel@salemreporter.com.